development of not only the town but the island as well. architecture and heritage of the town. the town of Soufriere was held on Friday April 5, 2019. In the coming days, work will begin on upgrading the Soufriere Mini stadium into a FIFA and IAAF approved facility. 15. Soufriereâ&#x20AC;&#x2122;s Rising Young Cricket Star 16. Soufriere Carnival 17. Miss Independence 2019 18. World Class Hotels and More! ich in history and cultural heritage and bestowed with equally opulent natural resources by mothernature, the west coast town of Soufriere, boast some of the most scenic sites not just in Saint Lucia or the Caribbean, but I dare say the world. The visage of this town, with its mystical twin peak Pitons and Sulphur Springs, (which forms part of UNESCO’s world heritage site here) is alluring, magical and at times even serene. Soufriere is also well known for its contribution to tourism in Saint Lucia, with some of the best attractions on the island, the best dive sites, as well as award winning hotels, rated among the best in the world and that’s no idle accolade. We spotlight some of these properties and their recent upgrades in this publication. But while the town has become internationally renowned for tourism, contributing tremendously to the island’s GDP and Foreign Exchange, the Government of Saint Lucia is cognizant that with this, must come the development of other areas. 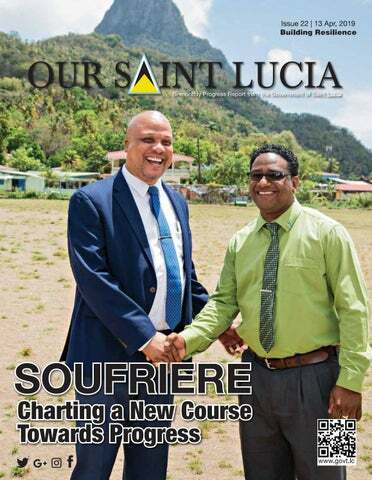 To this end, the Government of Saint Lucia is seeking to diversify the areas of economic activity in Soufriere which has been attracting a number of new businesses recently, some of them featured here. playing field, and also work on the court at Fond St. Jacques. Work has also begun to clear the road to the main forest, the Edmunds Forest Road, to increase and improve access for farmers, and also for taxi drivers and tour operators. Under the loan which was approved in parliament in December of 2018 from the Taiwanese in the sum of US$150 million, of which US$100 million will go towards the airport and US$50 million towards roads, through this national road development program we will be constructing a brand new road from Esperance through Diamond into Soufriere. And, for the residence of New Development who has suffered for so long, the New Development roads are down on this program, to be fully rehabilitated as well. Government is finalizing plans to acquire the land for the new Soufriere Hospital on Sir Arthur Lewis Street, which will see the commencement of construction later this year. I would like to thank the Prime Minister Allen Chastanet for all his support and encouragement as well as my Cabinet Colleagues. Thanks to the Taiwanese Ambassador Douglas Shen for sharing in our vision for Soufriere. To the SRDF and its directors past and present, I say thank you, for your enthusiasm and dedication. I would also like to thank the Mayor and my support team. To the people of Soufriere/Fond St. Jacques, I would like to thank you, for your patience, understanding and support, and I continue to ask for your support as we continue the good works and the developmental projects we have outlined, so that one day we can make Soufriere the Eden of the Eastern Caribbean. his efforts in initiating an outreach cleanup program for the out-districts in the constituency and a weekend clean-up task crew. Accessibility, security and safety of the town is also of utmost priority to him. “My mission is to see to it that human empowerment, capacity building and physical development is engendered through strategic collaboration and interventions on critical projects and programs geared towards the transformation and upliftment of the town and its people,” Mayor Gangardine says. Mayor Pius Gangardine is a silent humanitarian, who continuosly supports charitable activities in his community. He believes that the town of Soufriere holds a multitude of potential derived from its history and its constituents and he strives to ensure that community spirit thrives and that the people are proud of the richness and resourcefulness of Soufriere. The construction of the pools began during the latter part of 2018 and, after a slight delay, work resumed on the three structures, with the overarching goal of a speedy completion. According to Mathurin the SRDF is quite pleased with the work done and that so far the positive response and feedback from customers – both local and foreign, has been overwhelming. General Manager of the SRDF Franklin Solomon commented that he is proud to be presiding over this momentous occasion as the Sulphur Springs Park is one of the prized jewels of the town of Soufriere. Following the upgrade the management of the Sulphur Springs Park has revised the price structure and the opening hours have been extended to 11 PM. he Sulphur Springs in Soufriere is one of nature’s gifts to the town and by extension Saint Luca. The hot springs and baths each year attracts thousands of visitors, contributing much revenue to the economic development of not only the town but the island as well. The park also provides employment for hundreds of residents. The Sulphur Springs Park, which is managed by the Soufriere Regional Development Foundation, last year started work on major upgrades. And in March of this year the SRDF announced the commissioning of three additional pools. According to Malcolm Mathurin, Senior Projects Officer at the SRDF, the commissioning of the three additional pools to the operational site at the Sulphur Springs Park was to alleviate the problems of congestion at the park particularly during the peak cruise ship and tourism seasons here. “It had been a concern of ours for some time now, the overcrowding we had when we were just operating a single pool. While you had the additional tours of the park and the Sulphur Springs, over the years, the mud baths and the pool have become increasingly popular with visitors, more so as it is seen for its health benefits,” Mathurin says. NEW PRICE STRUCTURE FOR SULPHUR SPRINGS A revised price structure as of March 1st 2019 for the newly rehabilitated and extensively upgraded facility is listed below. purposes. The Spa also offers a mini facial service where visitors can choose from various masks to repair and/or restore dehydrated and damaged skin; foot massages and hot stone back massages. The mud baths at Sulphur Springs attract people from all over the world because it is said to detoxify the body and helps heal sun burns, eczema, arthritis, sore joints, and more. During a tour one can witness boiling mud, steam and water visibly appearing, observed from platforms surrounded by vents releasing clouds of sulfur gas. Close to the glowing steam at Sulphur Springs, a river flows which has created the natural mud baths. This river is gray in color and the temperature averages 113 degrees Fahrenheit! The gray color is caused by high concentrations of sulfur, iron, copper and all kinds of other components. Clients have the option of an hour photo shoot with a specialized photographer around the park. After the shoot, six HD photos are printed out or transferred to the client’s device of choice. Clients have the option of a personalized mug with a photo of their choice or getting their HD photos taken and transferred to their personal device. Amenities Available at the Sulphur Springs Park Apart from being able to indulge in the hot baths or take a guided tour of the Sulphur Springs, with its hot bubbling craters, the park also offers a number of other amenities. Apart from the interpretation center built several years ago and the vending area for crafters and refreshments, the Sulphur Springs Park now offers a smoothies bar, a mini spa and photography and souvenir shop. About the Sulphur Springs The Sulphur Springs in Saint Lucia is described as a dormant drive in volcano. The Soufriere Volcano (Sulphur Springs) last erupted in the 1700’s and originated from a weak spot in the crust of a collapsed volcanic crater. Sulphur Springs, as the crater is called, honors its name. Sulphur means sulfur and you already smell this from a distance. The town of Soufrière is the French designation of Sulphur or sulfur. The Sulphur Springs has been visited by some of the most well- known celebrities and international figures including Angela Basset, Richard Branson, Oprah and so many more. The Sulphur Springs Park now attracts an average of 200,000 visitors each year. Photo: Sulphur Springs 6 caption: The picturesque craters. COLLEGE FAIR n Wednesday April 3, residents of Soufriere and environs had the opportunity to receive relevant information about educational opportunities as well as prospective vocational training. The South West College and Career Fair sought to assist persons in career choices such as nursing, electrician, hair stylist, teacher, cruise ship employment and other professions, giving options for attendees to determine which school was right for them. he first established Credit Union in Saint Lucia, The Choiseul Co-operative Credit Union Limited is a reputable financial institution operating in the communities of Choiseul and now in Soufriere. In March the Choiseul Credit Union opened its operations to the public in Soufriere on Bridge Street. The products and services currently offered are based on the demands of members and are designed to improve their economic, financial and social wellbeing. SCSS at SPELLING BEE The one-day event was held at the Soufriere Waterfront and provided terrific opportunities for young persons to meet, discuss and get answers to their questions from school admissions officers on their institution’s course offerings while discovering and exploring other institutions they may not have considered. Information was also provided on available bursaries and scholarships as well as financial advice and available job opportunities in the tourism industry. Eleven technical/vocational and academic institutions, one employment agency and four financial institutions participated. This year’s event was organized by BrightLight Development and is sponsored by All Biz Ltd and Calabash TV, Choice TV, DBS, Bank of St. Lucia, LUCELEC, Choiseul Cooperative Credit Union, Fond St. Jacques Cooperative Credit Union, Exel Signs, Soufriere Foundation, DIgicel, Dot Com Entertainment, Lionel Electricals and the Soufriere and Castries Constituency Councils. The Soufriere Comprehensive Secondary School placed second at the recently held Francophonie Spelling Bee competition. Destin Elizee, a form one student received a laptop, a trip to Paris and lots of other prizes. FIFA COMPETITION n efforts of reigniting the Youth and sport spirit in the serene yet vibrant community of SOUFRIERE, the SOUFRIERE YOUTH AND SPORTS COUNCIL has planned the FIRST ever FIFA 2019 COMPETITION. The event is being held this Saturday April 13, 2019 at the Soufriere Mini Stadium. Registration is open to male and female competitors. Lots of attractive prizes to be won! About Soufriere The town of Soufriere lies on the West coast of Saint Lucia. Its history dates back to the 17th century and it is home to the world famous twin peaks of The Pitons, which were declared a World Heritage Site by UNESCO on 14th February 2005. The Amerindians were said to be the first to settle in Soufriere thousands of years ago. The town of Soufriere, its regions and hills got their names from the French who dominated during the 1700s. Even today, customs, language, foods, place names and architecture still predominate today. The name ‘Soufriere’ is a French term used to describe any volcanic area, literally translated to mean, “sulphur in the air”. The history of Soufriere is inextricably linked to the history of Saint Lucia. The earliest inhabitants of Saint Lucia, that is, its indigenous people were the Amerindians who sailed up the chain of Caribbean islands from the Orinoco basin. With the advent of the Europeans to the West Indies, with the French and English wrangling for Saint Lucia, Soufriere sprung to importance in the early 1700s when the island was under French colonial rule. In 1713, the Devaux family received a land grant from King Louis XIV of France of approximately two thousand and three hundred (2,300) acres of land in Soufriere in recognition of service to crown and country. Like the rest of Saint Lucia, the inhabitants of Soufriere are descendants of slaves brought here from Africa. Soufriere also played a major part in the slave trade and ultimately the slave revolts that led to the abolition of slavery on August 1, 1834. Today the town of Soufriere is known for its tourism, with some of the best Hotels and attractions including the best diving sites and coral reefs in the Caribbean. According to the Mayor of Soufriere, the bus terminal will be a complete facility with all the necessary amenities. “This new bus terminal will be able to accommodate all of the operators with loading and off-loading zones designated to each route. In addition to this we are constructing concession booths and a vending area as well as washrooms,” Mayor Pius Gangardine says. The Mayor went on to explain that this is in keeping with offering Soufriere a facility befitting of the town and having a more orderly bus system that is properly managed to alleviate the problems of traffic congestion. “The old area where the buses were near the town square had really become congested and very difficult to manage and so we felt that it was necessary to build this new facility,” the Mayor went on to say. This first Phase of the Old Trafford Development Project will also include a farmers market. “This provisions and produce market is again an answer to the cries of persons for us to alleviate the problems associated with vendors selling on the sidewalks which impeded pedestrian access,” Mayor Gangardine explained. He went on to inform, that the facility will be for multiple uses including the hosting of small events. Phase One of the Old Trafford Development Project, which employed approximately 50 persons during construction, is expected to be operational by June 2019.
n August of 2017 the Soufriere/Fond St. Jacques Constituency Council informed residents, motorist and the general public that Phase One of the Old Trafford Development Project would commence. During construction, it has been necessary to close all access to the Old Trafford Playing Field, as well as vehicular parking in the area. This phase of the project, which is now mere months away from completion, will include a brand new bus terminal for mini-bus operators plying the three routes in Soufriere. These are; the Soufriere-Castries route, Soufriere- Fond St. Jacques and Soufriere- Vieux Fort. Phase Two of the Old Trafford Development Project when it commences will include a craft market. In 1999, the Soufriere craft market, which was located at the waterfront was destroyed by Hurricane Lenny and has not been replaced since. This new facility will offer crafters a place to ply their wares and give visitors an additional spot to visit. This next phase of the project will also include a restaurant and duty free shops. The Old Trafford Development Project is being implemented under the Constituency Development Program by the Soufriere Constituency Council and the Ministry for Economic Development, Housing, Urban Renewal, Transport and Civil Aviation. Another Jewel in the town’s Crown! oming down the final gentle slope into Soufriere, just before veering left into the heart of the picturesque town, what used to greet the eyes was an empty space leading to a beautiful beach enjoyed by locals and visitors. However, if you are in Soufriere today, that wonderful scene that once greeted you has been greatly enhanced with the completion of one of the best beach park facilities on the island. The people of Soufriere and indeed Saint Lucia welcomed the grand opening of the Hummingbird Beach Park facility on Friday April 5, 2019. It was quite a momentous occasion. Over the last few months the Government of Saint Lucia, through the parliamentary representative for Soufriere/Fond St. Jacques Hon. Herod Stanislas and the Soufriere Regional Foundation, worked assiduously to ensure that attention was paid to detail so that the people would be given the best product possible. The Speaker of the House, Ministerial Colleagues, the Ambassador of Taiwan, Mayors of Soufriere and Castries, the SRDF Chairman and Miss Independence celebrate with the Soufriere/ Fond St. Jacques MP. town, my Government cooperated with the Government of Saint Lucia to start this project since 2016,” Ambassador Shen said. “I am more than happy to have been told that with the completion of the project, the feedback of the community has been positive as the residence of Soufriere feels proud of this wonderful park. I believe that in the coming years, the Soufriere Hummingbird Beach, will become one of the landmark tourism sites in Soufriere,” the Ambassador went on to say. by taking ownership of it and being the guardians for its upkeep. He went on to thank the people of Soufriere for their backing and continued support and cooperation. The Hummingbird Beach Enhancement Project is designed to promote entrepreneurship and sustainable jobs for small business owners, water taxi operators, tour operators, vendors, and water sport operators in Soufriere and Fond St. Jacques. Hon Herod Stanislas asserted that work never quite stopped on the project, but that measures were taken to reevaluate the project. This was backed by Mayor Pius Gangardine who told Our Saint Lucia that the project had simply been put on hold for “reassessment” and “redesign”. “We really wanted something apt for this town and its people and in a few months when we officially open this square I am sure that the people of Soufriere and indeed Saint Lucia will be proud of what we have done here,” Mayor Gangardine says. The new square will feature green spaces, park benches and fountains. The centerpiece of the square will be the Freedom Monument. The monument which has been sitting in storage for more than twenty years will now have a home. he Soufriere Regional Development Foundation (Soufriere Foundation) is a nonprofit company established by the people of Soufriere to promote, encourage, support, facilitate and coordinate local development initiatives in the Soufriere region. The Soufriere Foundation was formed in 1991 out of the trail blazing work of the Soufriere Development Programme (SDP). The SDP was a predecessor organization formed by Cabinet in 1986 at the behest of a few visionary individuals of a local community development group called the Soufriere Development Committee, which consisted of pioneers such as Clem Bobb, Nick Troubetskoy, Joan Duboulay-Devaux, Michael Duboulay, Lennard Riviere and Pelham Reid. The SDP was formed with the goal of promoting coordinated socio-economic development for the Soufriere region and creating socially acceptable, environmentally friendly and economically beneficial tourism-related infrastructure and amenities. The SDP is best known for its development of the Sulphur Springs Park, construction of the Soufriere jetties and waterfront, development of an inventory of the community’s heritage assets, and initiation of an anti-Harassment Programme. Mr. Clem Bobb was the programme’s first chairman. 88.5 Soufriere FM 88.5 Soufriere FM came onto the airwaves on September 1st, 2010 much to the excitement and jubilation of project sponsors; Soufriere Regional Development Foundation and UNESCO (United Nations Educational, Scientific and Cultural Organization). The radio station which operates from the scenic South-western town of Soufriere, has firmly established itself as giant in its own right becoming the radio station of choice in Soufriere and environs. Its listening audience are tuned in to the south of the island through to Vieux-Fort with additional communities like Canaries and Babonneau to the extreme north of the island reporting good reception quality in certain quarters. The radio station is staffed by four announcers, a news presenter, a sales representative and a supervisor who coordinates the programming and operations. Programming is set around relevant and current issues with a variation in genres of music being aired as part of its entertainment package. Following a participatory retreat exercise to identify the concerns, needs and priorities of the community and to develop a plan for the development of all sectors of the Soufriere community in 1990, the Soufriere Regional Development Foundation Limited (The Soufriere Foundation sometimes called the SRDF) was formed and duly registered under the Commercial Code of Saint Lucia on January 05, 1993. 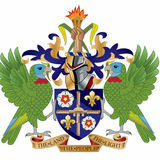 Between 1993 and 1995, the SRDP was voluntarily wound up and all its assets and liabilities transferred to the new company, the Soufriere Foundation. In 1996, ownership and management of the Sulphur Springs Park was transferred to the Soufriere Foundation through a 99-year emphyteutic agreement made with the Government of Saint Lucia. Today, Sulphur Springs Park and the Soufriere jetties represent the organization’s main income earning centers. The Sulphur Spring Park is managed by the SRDF and recently received a major upgrade with new pools. In 2008, the Articles of Association were again changed this time to allow the Prime Minister of Saint. Lucia to appoint the full board of the organization, including selection of its Chairman and Deputy Chairman. the facilities and we do not put proper programming in place starting at the grass roots level from toddlers to juniors and even seniors and veterans, sports and youth development will not be a success,” the parliamentary representative said. with responsible for sports and with the support of the Prime Minister and my cabinet colleagues, it is my aim to advance our national sports evolution and we will be doing this island-wide,” he went on to say. He went on to add that there needed to be the development of clubs, the training and development of coaches and the successful implementation of sports programs to compliment the facilities. “We also need the necessary equipment for training and practice so that our athletes can become more competitive when they go out there,” Hon. Herod Stanislas said. “As a Government, we recognize that sports is a serious instrument for the holistic development of our people and this program is to ensure that through the promotion of sports as an engine of growth we can create a stronger and more energetic nation,” the Youth Development and Sports Minister emphasized. Hon. Guy Joseph on the day of the sod turning explained the rationale behind the funding for the sports program through the Constituency Development Fund under the Taiwanese Government. He addressed the 12 million for the projects which he said was the price tag for the entire program and not for any one consultant. “I want to reassure the people of Saint Lucia of the focus of the government to deliver a brand new Saint Lucia to them and these sports facilities, which forms part, is one of the first major sports development program being done by any government in any one given period of time,” Hon. Guy Joseph said. “What we are doing here is building world class facilities that can match facilities in any part of the world and what better place to start this project than in Soufriere home to the Pitons a UNESCO world heritage site,” he went on to say. Soufriere's Rising Young Cricket Star Consultant Don Lockerbie explaining the projects. fter he was named among the reserves for the 2017 edition of the WINLOTT Under 15 Windward Islands tournament, Kevin Gassie was delighted to make the final squad for the 2018 iteration. On home soil, the Soufrière Comprehensive student played a big role as Saint Lucia won its fourth tournament in five years. His contribution was especially telling in the decisive game against defending champions Grenada. Gassie’s bowling helped hold the champs to just 100 runs, as he took 1-16 and bowled two maidens. But it was his batting which truly shone, as he made an unbeaten 51 off 72 balls to lift Saint Lucia to victory. His 96 runs and 9 wickets earned him Team MVP for Saint Lucia, and he was selected to the Windward Islands age-group team, the first time ever that a male cricketer from Sulphur City has made a sub-regional team. Gassie plays for his home community of Belfond in the Soufrière T20 tournament, and trains with the Cricket West Indies Northern Cluster Grassroots Cricket Programme. SOUFRIERE Carnival an explosion of culture and colour! n 2017, Soufriere carnival returned with a bang, claiming a position as one of the leading community carnivals in Saint Lucia. After an eight year hiatus, a team comprising young and exuberant carnival enthusiasts from Soufriere, came together to relaunch Soufriere Carnival under the banner the Soufriere Events Committee. The grand launch event that year was held under the theme “Rebirth: Awaking of the lost culture”. The launch featured a variety of local acts from Soufriere and other communities, including Mantius, Jay Budz and Dennery Segment artistes, and Ricky T backed by the band DYP. The event which was held at the Soufriere mini stadium also featured the appearance of the Soufriere Carnival Queen Pageant contestants. The sold out event, was the sign that the Soufriere Events Committee was on to a good thing and the events that followed, culminating with the two-day parade of the bands were all very successful. The parade saw a blend of traditional masqueraders keeping the culture alive blending in with the more modern mas to create a wonderful spectacle for onlookers. With the support of the Soufriere Regional Development Foundation, Soufriere carnival returned in 2018 with even more hype. The launch which was another sold out event paved the way for a slew of events which saw participation from not just patrons from the town but all over the island as well as a number of visitors. The 2018 Soufriere Carnival theme was “Unleashing the Culture: the Journey Continues.” The parade of the bands that year saw an increase in the number of fully costumed bands taking to the streets. Soufriere carnival queen 2018 Anne Cecil Thomas presided over the event. This year the grand launch of Soufriere Carnival 2019 will take place on April 27. This will be followed by the Inter-commercial Kaiso on May 25, Kiddies Carnival June 9, the Miss Soufriere Carnival Queen Pageant June 15 and the Parade of the bands June 23 and 24.
fter winning the 2018 Miss Fond St. Jacques pageant, 20 year old Sancia Charlemagne graced the stage of the 2019 Miss Independence pageant. In the end not only did she receive the judges approval to wear the crown, but was a crowd favourite through it all. Sancia Charlemagne, the proud daughter of Sulphur City, Soufriere (Fond St. Jacque to be exact) is a music teacher at the Soufriere Infant School and a facilitator at the Community After School Program (CAPS) in Fond St. Jacques. She is very much entrenched in her community, having been involved in several groups and organizations. “Since I was a little girl I was also encouraged to participate in community activities by my parents and it is something I still do,” she told Our Saint Lucia. “I have been involved in various cultural and church youth groups, drumming and folk groups as well as the sports club,” she explained. This involvement was her impetus for taking part in the Miss Independence Pageant not to mention the support of the Soufriere Constituency Council, the Mayor and the people of Soufriere/Fond St. Jacques. And it all came to pass on the night. As Sancia made her first appearance, the screams and shouts from her supporters and fans were deafening. MP for Soufriere/Fond S. Jacques Herod Stanislas was also there lending his support. Since her victory she has made several public appearances and during her reign would like to focus on youth development particularly in her community. Ms. Independence 2019 Sancia Charlemagne crowned at the National Cultural Center. As for her future; “I love the stage, I love performing, I love theatre and so I would love to pursue a degree in the performing arts and since I also love Economics maybe balance things off with studies in that field as well,” she says confidently. Fine Dining & More! oufriere is home to some of the leading luxurious hotels in the world including the award winning Jade Mountain and Anse Chastanet resorts, as well as Ladera Resorts, Sugar Beach and Stonefield Estate. A number of smaller, yet just as elegant properties dot the Soufriere landscape (many locally owned) including La Haut Resort, the Still Beach, Tropical Paradise, the Hummingbird Beach Resort and the Downtown Hotel. Fond Doux Plantation & Resort With its luxurious cottages, restaurants and a pool, all intertwined within the habitat of an award-winning Caribbean chocolate plantation in Soufriere, Fond Doux has been the recipient of several international awards over the years. The Victorian facade of this fine property was recently upgraded with a spa and new restaurant where birds, fruit trees and flowers greet you each day. This renowned eco luxury boutique resort, in mid-March, was awarded Saint Lucia’s luxury resort of the year 2019 at the Global Luxury Hotel and Spa Awards. The Global Luxury Hotel and Spa Awards, was designed to recognize companies, brands and individuals who are excelling in the very growing industry of luxury hospitality- those who go beyond to exemplify experiences clients are seeking, when looking for their latest getaway. These resorts have generated much employment to the people of Soufriere and the Government of Saint Lucia to provide incentives through the Department of Tourism to create growth in the sector. Our Saint Lucia spotlights two of these locally owned vacation properties in Soufriere as well as a new souvenir shop and café. Ti Tak Souvenir Store, Bar and Café Recently opened on #32 Bridge Street, Soufriere, but already Ti Tak is making a name for itself as a cozy spot to shop and relax over a cup of coffee or their signature rum punch, in air conditioned comfort. Located inside the Colombette Drive, among the lush green vegetation, Crystals Saint Lucia is a gem with another amazing view of the Pitons. Nestled within the tropical paradise of Soufriere, one of the magnificent villas at Crystals. Inside you will find art pieces, hand crafted jewelry, t-shirts, beach wear, gifts, souvenirs, locally crafted organic chocolate, local rums and spices. If an escape to peace and tranquility is your thing, the landscape and serenity of this property will stimulate your imagination and soothe your soul. Fond Doux: One of the Victorian styled villa houses at Fond Doux. At the end of March this year another award followed. This time the Fond Doux Plantation Resort’s Bamboo Restaurant and Mamma la Terre Spa were among the recipients of the 2019 Experts Choice Award from Trip Expert.Experts Choices recognizes endorsements by leading publications with more than 1.5 million reviews taken into account. The villas at Crystals are stylishly furnished with handmade furniture that is both locally made and collected from exotic countries around the globe. The tree house restaurant is a unique centerpiece while each villa stands proudly in its own uniqueness and provides luxury amenities to satisfy the highest standard of comfort. Private pools, Bbq grills, sun decks, full kitchens, A.C. and Cable Tv and WiFi included.